Permite arrancar hasta 9 sistemas operativos diferentes. Puede arrancar sistemas operativos instalados tanto en particiones primarias como extendidas, en cualquiera de los discos duros instalados en el ordenador. Puede ser instalado desde casi cualquier sistema operativo. No necesita una particion propia, sino que se instala en la primera pista del disco duro, la cual se encuentra, por diseño, reservada para este tipo de funciones. Tambien puede ser instalado en disquete, sin tocar para nada el disco duro. Incluye un temporizador que permite arrancar un sistema operativo por defecto. La configuracion del programa puede ser protegida con clave. Todo el programa funciona en modo grafico (necesita una VGA o superior para funcionar), e incluye multitud de iconos para cada tipo de sistema operativo disponible en PC. Oculta particiones primarias de modo que se pueden tener varios DOS y/o Windows en un mismo disco duro. Permite poner claves independientes a cada sistema operativo, para restringir el acceso a cada uno. Facil de traducir a cualquier lengua. Puede intercambiar discos duros, permitiendo arrancar desde el segundo disco duro sistemas operativos como MS-DOS. Incluye el sistema SafeBoot, que permite seguir arrancando el disco duro incluso en caso de que GAG sea sobreescrito por accidente. Soporta varios tipos de teclados internacionales (QWERTY, AZERTY, QWERTZ y DVORAK). Soporta discos duros de hasta 4 terabytes (4096 gigabytes). Totalmente gratuito (se distribuye bajo licencia GPL con fuentes incluidas). Fixed some sentences in english translation. The keyboard type was not being stored. Fixed. Added a direct installer from Linux. Now the configuration data is stored in a fixed zone (this allows to create external configuring programs). Added HTML documentation, much clear and easier to read and understand. Added technical documentation, explaining the internals of GAG. Fixed the languages Turkish and Bable. The user can choose if he wants to hide all primary partitions (like versions up to 4.1), or hide only the minimun needed (like version 4.2). Added an installer for DOS/Windows (a simple .BAT file). Added an ISO image to create a bootable CD with GAG. Added support for Linux Extended partitions (type 85). Now GAG hiddes the minimum number of primary partitions, so now you can see all primary partitions after the boot partition. New questions and answers added to the FAQ. Added an icon for OpenBSD (and recognices its partitions). Fixed some language errors in the french version. New icons for Linux and HURD. All language versions has been packed in a single floppy disk image, in order to simplify the distribution of GAG in magazines, Linux distributions, etc. Fully support for hard disks greater than 8Gigabytes. The new limit is 4 Terabytes (4096 Gigabytes). Now GAG shows the primary partitions in a different color (black) than the extended partitions (blue). This helps to configure it. Now the timer is disabled only when you delete the default O.S. (in old versions, the timer was disabled everytime you deleted an O.S.). Fixed a bug. Click here to know more about it. Graphic environment redesigned. Now GAG works in 640x480 mode, wich gives a better appearance. Fixed a translation bug in the Brazilian Portuguese version. Now it can be installed in hard disk pressing the 'I' key, as say the menu, instead the 'H' key (sorry). Fixed a 'security hole' with SafeBoot. See README.TXT file for details. GAG can swap hard disks, allowing to boot and install operating systems such as MS-DOS in the second, third... drive. 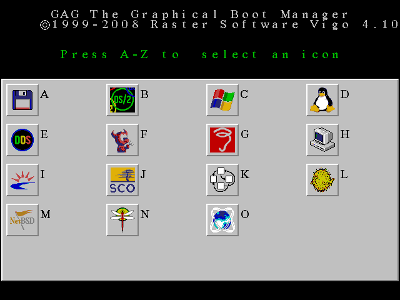 Has the SafeBoot system, wich allows you to boot your hard disk even if GAG is overwrited. Older versions didn't change the active partition when GAG hidded or unhidded one. Fixed in this version. Shows a message when the installation is succesfull. Recognice the new LBA extended partitions of Windows 95. Shows in the screen the version number. New icons for Solaris and SCO Unix. Source code with better documentation. Now GAG guarantees that only one primary partition is visible each time (in older versions, under certain special conditions there was possible to have two unhided partitions). Fixed a bug with hard disks greater than 8GBytes and/or with more than 16 partitions. New icons for Linux (thanks to David Dapena) and OS/2. Has a new icon for BeOS and another for a generic O.S. Recognizes FreeBSD partitions (doesn't mark it as 'unknow type'). Pressing RETURN with the timer active boots the default operating system. Allows for different passwords for each operating system. Multi-language version (if you want a version in your language, just write me). In some motherboards, GAG sets the time to 12 o'clock. Fixed in this version (using the timer 2). Has a color bar that allows you to know how time rests to expire the boot timer. GAG now tests if there are read/write errors when it installs or loads from floppy or hard disk. Added some little details that makes it easier to configuration.